Please read this entire page before purchasing! Shirts come in your choice of men’s or women’s style and cost $15 each (includes shipping anywhere in the US) for sizes S – XL. XXL add $1. I can do larger sizes too but email me for pricing info. If you’d like a different style shirt besides a standard t-shirt, say a tank top, long sleeve or whatever else, I can usually make it happen, just email me and we can figure it out. If you don’t want to deal with Paypal I also have a Square account so just email me at that same email address and we can figure out a way for you to pay that way. 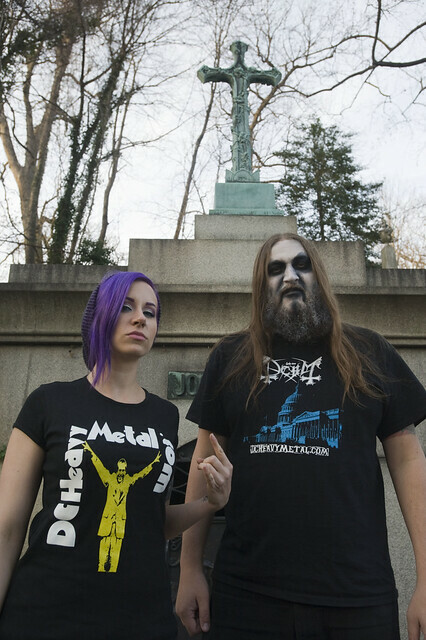 Through the end of December 2013 I’m taking pre-orders for the Mayhem style shirts (like the one in the photo below) that are made to parody the cover of Mayhem’s classic album De Mysteriis Dom Sathanas. I don’t think I’ll order too many extra so if you want one I highly suggest a pre-order. Note that the art is a darker blue on the actual shirts to more closely reflect the album cover art. I’ve still got a decent stock of the Nixon Vol. 4 shirts (seen below), parodying the cover of Black Sabbath Vol. 4 but with Richard Nixon instead of Ozzy. These are sizes Men’s S-XXL and Women’s S-XL. I’m still out of bumper stickers, sorry, but I’m working on getting more in 2014. 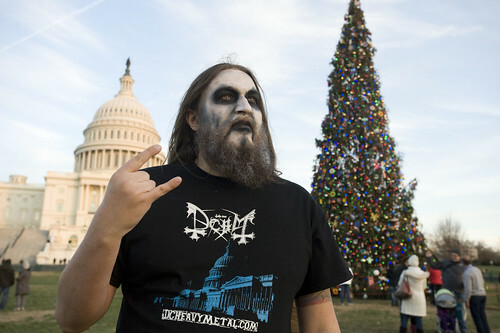 That’s me in the Mayhem style shirt and yes I really did go to see the National Christmas Tree in corpse paint. Both of the shirt designs were my idea but since my graphic design skills aren’t as good as my ideas I got RJ Mahoney to actually create them for me. The photos in this post were all shot by Louie Palu and you can see more of his work here. He’s a great photographer and this is probably the most ridiculous thing he’s ever had to photograph. 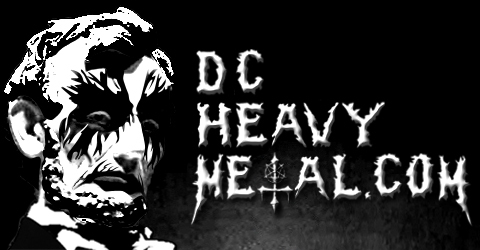 The black metal style corpse paint makeup in these photos was done by Jessie Campbell, a local freelance make up artist (and metal head) who you can hire for your next photo shoot here. She’s also the model in the girly Nixon shirt. The shirts themselves are printed by MiNDJACKET Designs who can print your band’s shirts too.